Once you complete the priorities you have a Business Protection solution (as seen above). Keep your protection strong with regularly scheduled maintenance to keep up with changes in your IT environment and your business. How Far Does Your Data Protection Go? Assets like a building or vehicle usually have an insurance policy to help with replacement in case of loss or damage. Company data requires similar protection. The impact of its loss can be disruptive if not catastrophic. It can be much more difficult, or impossible, to recreate, and every hour of “down time” costs significant money. 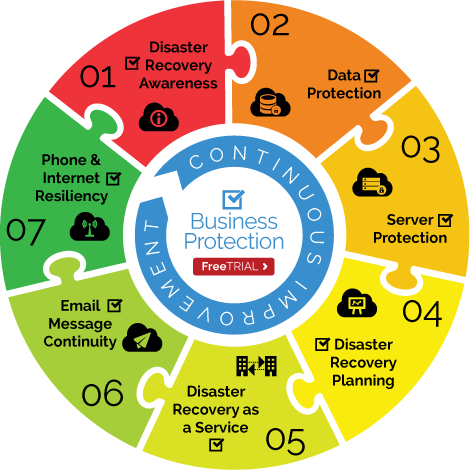 Data protection and data availability must be discussed and prioritized, then solutions implemented to provide contingencies for an organization’s survival. What is the cost of downtime for your organization? Priority 1: First, create redundant copies of data in case of IT failure or site loss. Every effective strategy starts with data backup. It can be difficult, if not impossible, to recreate data once lost or corrupted. Priority 2: Next, equip business with tools to recover Operating System Environments (OSEs) and applications. Layer on recovery solutions, weighing priorities and expense. This ensures the organization can normalize quickly after a data loss incident. It can mean the difference in your business staying relevant -- or losing market share. Priority 3: Design, test, and document a plan to recover high priority applications and data. Identify high priority applications and data files and make sure they can be accessible quickly. Priority 4: Acquire tools to minimize downtime of high priority applications and communications. Priority 5: Maintain with regularly scheduled updates to ensure plan keeps up with changing business needs and IT enhancements. Finally, establish ongoing maintenance and updates to keep the plan effective.